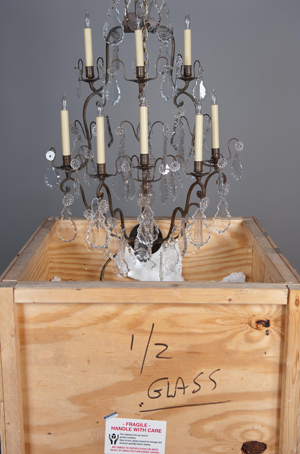 Greenwich Metal Finishing can crate, pack, and ship any item from large crystal chandeliers to the most treasured family heirlooms. Through years of experience, especially in antique lighting transport, Greenwich Metal Finishing has developed a secure and safe crating system that eliminates movement and absorbs shocks. 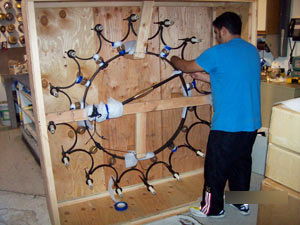 Each piece is placed in a custom crate built to the item’s dimensions and is then carefully packed. We are experts at crystal chandelier shipping and can ship anywhere in the United States. All work done at Greenwich Metal Finishing’s facility is insured against damage or loss, and each item is documented and identified upon receipt. Transport insurance is available for an additional fee. Once we have inspected, crated, and packed your fixtures, we can transport them to your destination anywhere in the United States or around the globe. For clients within Fairfield, Westchester, and Putnam counties, New York City, Northern New Jersey, and Long Island, we can send our technicians to your site to professionally install your lighting fixtures with the utmost care.